‘Jeeves and the Wedding Bells,’ by Sebastian Faulks – So here’s the trick: write “homage” on your work of fan fiction, and perhaps it will be picked up for review by The New York Times. That’s right; they’re not reviewing more women authors, but they are now reviewing fan fic. There’s probably a snowball flying across some region of hell right now. Perhaps Frame couldn’t decide how much of Dickens’s plot to include in his own, how much he could trust the reader to know without being told. It’s here that the inherent predicament of this novel — of writing not a version of an earlier great work but an addendum to an earlier great work — kicks in. Catherine is believable and sympathetic as a young woman, but as the Miss Havisham of “Great Expectations,” she must be limited to the contours of the figure Dickens constructed — strange, exaggerated, symbolic. Clare Clark makes a similar criticism in her Guardian review. There’s probably a snowball flying across some region of hell right now. Best line of the interwebs today! Ugh. Of all the authors least suited to fanfic, Wodehouse must be top of the list. Because his books are ALL about the voice, and voice is what is unique to an author. I am pretty much against published fanfic generally, but I can see the interest in, for instance, writing about Miss Havisham’s backstory. I cannot see how another Jeeves book is anything but a self-indulgent attempt at money-grabbing. PLEASE do not buy those fishbowl bookends. They are not clever. They are death traps. A goldfish (as pictured) requires 10 gallons of water and a MASSIVE filter to be healthy (they are notoriously dirty fish). Even a betta requires a minimum of 2.5 gallons (5 gallons is preferable) and a HEATER is all non-tropical climates. As a an aquarist, I really hate seeing that kind of stuff. Fanfic as a term seems to be applied differently in varying circumstances–the book the NYT reviewed doesn’t appeal to me but thinking back to P.D. James’s Death at Pemberley, was it labeled fanfic and criticized as such? If it was, I sure missed it. It was widely praised as I recall. I didn’t enjoy it at all but not because of a fanfic descriptor. Longbourn (a book about the Pemberley servants) on the other hand was very enjoyable–is it fanfic too? James and the Longbourn author are women, is that a difference maker? @Isobel – thanks for sharing about the fish. My first thought was using them for a terrarium or some other unintended yet decorative use. Much more potential and much less harm that way. @Janet W: I would call both of those fanfic. In general books which are published try to avoid the label, which is mostly used for writing that is made freely available online. But there is no qualitative difference between the two. @Catherine: That strikes me as an excellent reason. I like the ones where it looks as though the person might actually have read the book, rather than the ones where they are holding it as an alien object. Heh. Prolly way off topic, but in my experience bettas are very happy and long lived in traditional aquariums, with, yes, other fish. They’re peaceful with other (peaceful) species and much more active and showy in a regular tank. Just don’t put two males together. Ugh. Of all the authors least suited to fanfic, Wodehouse must be top of the list. Because his books are ALL about the voice, and voice is what is unique to an author. As a reader of the stuff fan fiction, I gravitate toward stories based on films and TV shows, and usually avoid fics based on novels, precisely because of the issue of voice. For me, a crucial aspect of a novel is the author’s voice, and it’s too jarring to read a story based on a novel when the voice is all wrong. That’s also why, as a fic writer, I only dabble in movie/TV universes. @P. Kirby: Absolutely! I have bettas in my large community tanks and they do great as long as they aren’t with other bettas or fish that are nippy (tetras for example will harass them to death and cause fin rot by constantly biting their tails). I meant those tank sizes as absolute minimums. My favorite of the Read posters was Sting in 19th C. garb from his role in The Bride. Swoonworthy! 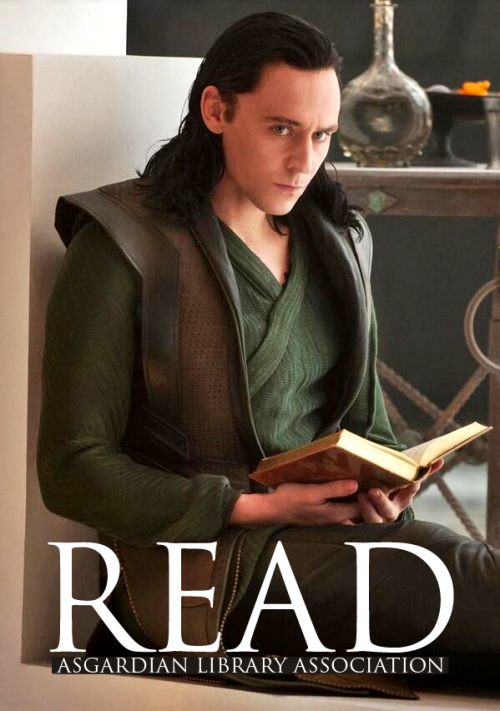 @Catherine: My library creates Read posters as promotional materials. Every year, we ask a well-known person or group on campus if they would like to be on a Read poster, and then we have an event with refreshments and little postcard-sized copies of the Read image that people can take. It’s been pretty popular. I think we’ve done it for maybe three or four years now. @Janet W – I’ve always thought of fan fic as work specifically shared in / written for fan fic communities, not as works written specifically to be published, but I’ve noticed that DA tends to refer to all work that’s based on someone else’s original work as fan fic. Maybe it’s just my prejudice against P2P fan fic that makes me bristle a little about calling something written for publication fan fic. The other thing that kind of bugs me about this is that it diminishes what I think is a long literary tradition of building off of / borrowing from other stories. Is every retelling of a classic fan fic? I suppose you could call West Side Story alternate universe Romeo and Juliet fan fic and The Wide Sargasso Sea Jane Erye fan fic, but I’m not sure labeling them that is that useful. The Faulkes book is not fanfic. It is a new Jeeves and Wooster novel that has been authorized by the Woodhouse estate. No doubt Faulkes is a fan, but to my mind fan fiction is written by fans organically without input from the author or his representatives. This is more in line with Ace Atkins continuing Robert B. Parker’s Spenser series at the behest of Parker’s estate. James McBride’s most recent novel is titled The Good Lord Bird. I saw him interviewed about his writing process on The Tavis Smiley Show and the book sounded fascinating. @Darlene Marshall: I remember that Sting poster hanging in my public library. I could’ve sworn that was in the 1980s, though. @Isobel Carr: Absolutely seconded! I’ve seen those exact bookends used for pretty rocks, cut flowers and candy, but never had anyone even consider putting fish in them. Honestly, open containers of water beside your books are usually an accident waiting to happen, and these ones are sort of tippy and hardcovers will knock them over unless they’re full of rocks or sand. However, those floating shelves are awesome, I have a few and they’ve added so much extra shelf space to otherwise small areas in my home! I’ve even seen ones customized with the bottom book dustcover reading “To Read” or “Keepers”, it’s pretty sweet. @cleo: That’s supposed to be Jane Eyre, not Jane Erye. Argh. Janine: Thanks for catching that. I think I screwed something up when I tried to italicize the title and somehow the last word got deleted instead. Re. the question of whether the Faulks book qualifies as fan fiction, I think the Washington Post review has a great discussion of the issue. I think it’s far too limiting to require that fan fiction be applied only to books that have been vetted through online fan fiction communities, especially given the number of folks who are undoubtedly writing what they intend to be fan fiction but who are now sharing those works with other fan fic authors. Moreover, books can belong to more than one category. In fact, fan fiction seems to be more a meta-category or meta-genre, in that books of different genres and sub genres can also be tagged as fan fic. I wouldn’t classify all renditions fan fic, but I would most definitely place this book in the category. Check out the way the URL to the New Republic review pops, too. I thought the PD James P&P book was awful. It sounded just like PD James and not at all like Austen. I’d like PD James before that book, but after, I just couldn’t forget how much better an author Austen is. I know–I am a huge Wodehouse fan (and particularly of the Jeeves and Wooster books) so I heard about this book earlier this year when it was announced. A part of me almost wanted to read it just because of the sheer insanity of trying to replicate a voice that cannot be replicated. But man, that WP review makes it sound worse than I could possibly have imagined–Bertie having feelings about his parents’ deaths? Bertie falling in love? World War I being introduced? No, no, and no. The whole point of the Jeeves books is that nothing serious is ever introduced. It’s not only that nothing bad happens–it’s that nothing bad could ever happen in that world. But there’s always been authors mucking about with other author’s works and characters. It’s only recently that we call it fan fiction. I think the reason Cervantes wrote part two of Don Quixote was because some anonymous person published their own part two and it pissed him off. @Janet – thanks for the WP link. That helped – I like the author’s description of three types of fan fiction.